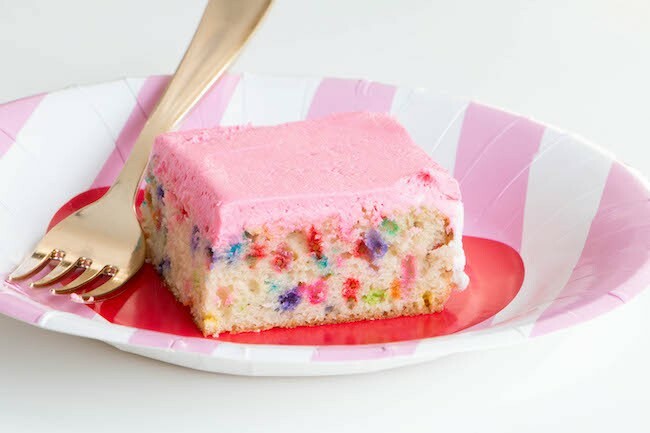 This one-bowl Funfetti cake recipe has very quickly become the go-to cake in my house and for good reason. It comes together in a flash, no breaking out the mixer, and it’s delicious! Super tender, great vanilla flavor, and lots of what everyone’s looking for – sprinkles! I bake most of my sheet cake recipes in my absolute favorite rectangular cake pan which you can find here with my Amazon affiliate link: Sheet Cake Pan. This is a fun, easy, and low-stress recipe that doesn’t require breaking out the stand mixer or hand mixer. It’s a tender cake with great vanilla flavor and tons of sprinkles! Position a rack in the center of the oven and heat the oven to 350 degrees F. Spray and flour a 9 x 13-inch baking pan, set aside. In a large bowl, whisk together the cake flour, baking powder, baking soda, salt, and sprinkles. In a smaller bowl or large glass measuring cup, whisk together the sugar, buttermilk, whole milk, vegetable oil, eggs, and vanilla extract. Bake, rotating the pan halfway through baking, until a toothpick inserted in the center of the cake comes out clean or with a few crumbs clinging to it, 25-30 minutes. Transfer the pan to a rack to cool completely before frosting or storing. Cake can be stored wrapped at room temperature for up to three days.